Spanish hotel group, VP Hoteles, has opened a new flagship property, VP Plaza España Design 5* in the heart of Madrid. Located on the iconic Plaza España in the historic centre of Madrid, the stylish 214-room property places VP Hoteles, a family-owned hotel group, at the vanguard of art, design and architecture. The spacious 214 rooms are divided into ten different categories and cover 17 floors combining state-of-the-art design and technology with modern functionality and enviable city views. Room features include private terraces, walk-in closets and private gyms. In keeping with VP Hoteles’ defining characteristic where all properties feature an interior garden, dramatic greenery is displayed throughout with vertical gardens stretching right from the underground parking area to the 17th floor. Using B720 Architecture Studio, as well as interior designers Cuarto Interior and Studio Gronda, the hotel cements its aesthetic credentials with works from contemporary artists Dario Urzay and Fernando Palacios. 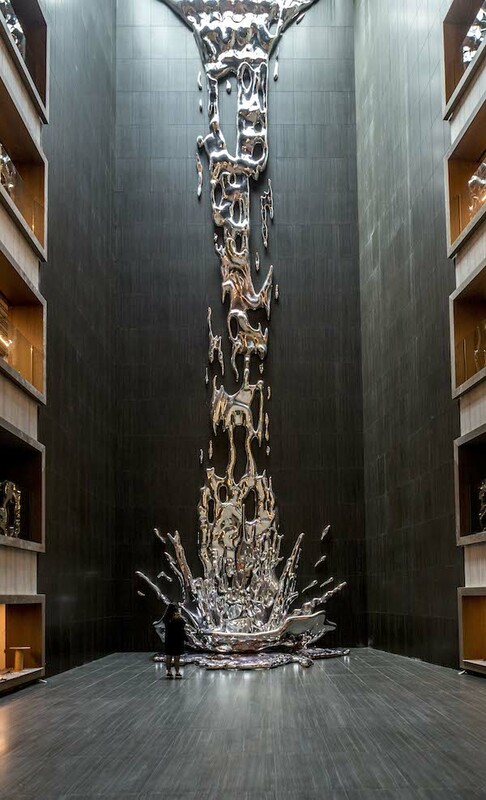 At the centre of the property is a 25m metallic waterfall sculpture created by Catalan artist Pere Gifre, known for his water-inspired themed sculptures, which dramatically tumbles from the glass bottom of the 12th floor swimming pool to the ground floor. The panoramic 360-degree Gingko Sky Bar on the 12th floor commands views of the Royal Palace and the Debod Temple as well as the peaks of Madrid’s surrounding mountain ranges and a bird’s eye perspective of the landmark Plaza España below. The property also contains an outdoor swimming pool, an elegant and spacious bar with floor-to-ceiling glass windows and a fully soundproofed nightclub. Dining options include the Botania restaurant, which takes up the ground foor of the property and is set in a sea of landscaped gardens from the façade on Plaza España to a generously proportioned patio on the hotel’s east side. Other elements include a comprehensive 24-hour gym, spa and Biloba Wellness Centre, ground floor lobby bar, buffet restaurant, spacious underground parking and a state-of-the-art business centre.